This post is a follow-up to Shield bug probing cherry bark. 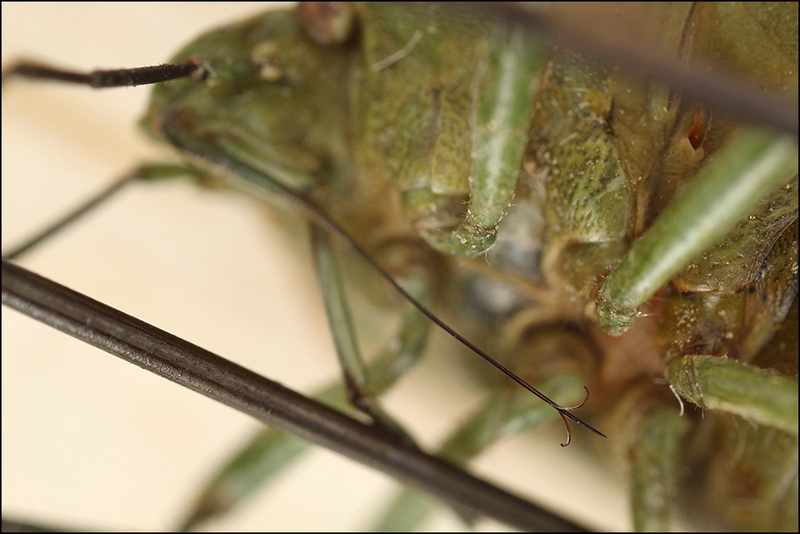 In that post, I showed some feeding behavior that I had not seen before, in which the bug removed some of its mouthparts from the rostrum while probing for food. At the time, I thought those mouthparts were the feeding tube. But on further investigation, I learned otherwise. Starting at the end, here is a detail of the tip of the feeding tube. In Hemiptera, mandibles, maxillae and labium are all elongate structures, while the labrum is relatively short. The food canal is formed by the opposed maxillae which are held together by a system of tongues and grooves. These allow the stylets to slide freely on each other, while maintaining the integrity of the food canal. The maxillae also contain the salivary canal. On either side of the maxillae are the mandibular stylets. These are the principal piercing structures and they are often barbed at the tip. 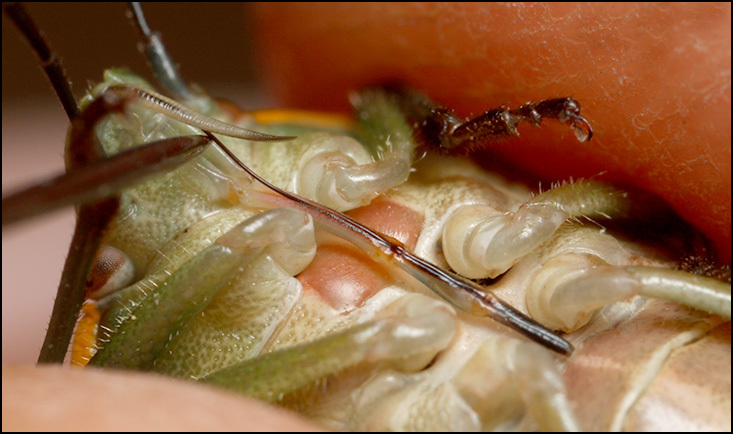 When the insect is not feeding, the slender maxillary and mandibular stylets are held within a groove down the anterior side of the labium. The hemipteran labium is known as the rostrum. It is usually segmented, allowing it to fold as the stylets penetrate the host. 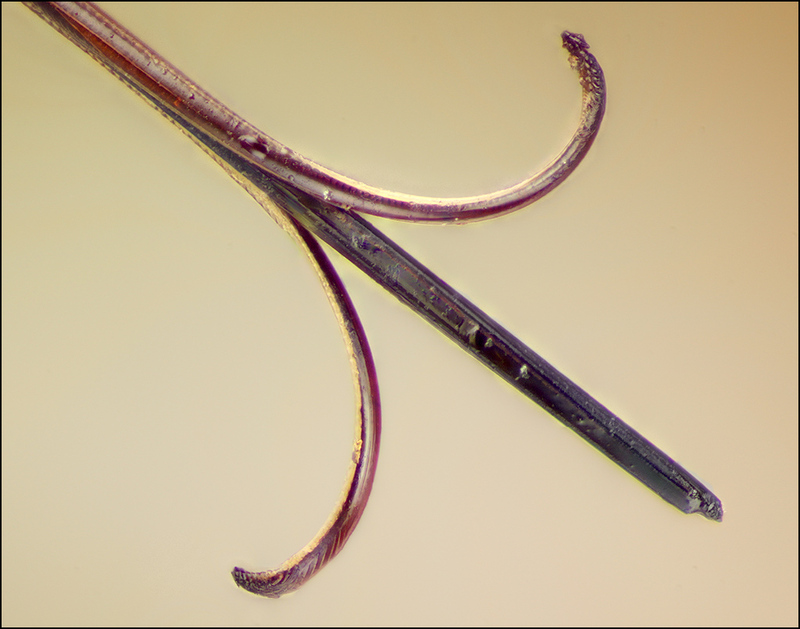 Image #1 at top of post shows a prepared specimen, in which the maxillary and mandibular stylets were pulled away from the labium and separated slightly as they dried. The barbed ends of the mandibular stylets can be seen clearly as the curled structures, while the interlocked maxillae remain straight at the center of the assembly. Here are two more images showing a wider view for context. Image #2 is the prepared specimen again. The labium (rigid part of the rostrum) is held out of the way with an insect pin, while the labrum and stylets are in more or less their normal position except for the curling of the mandibular stylets. Image #3 is a different specimen, this one live, using an insect pin to manipulate the mouthparts so as to show the labrum and the stylets in relation to the rigid segmented labium that forms the rostrum. You can see another view of these structures in operation in THIS POST by Mike Gordon at flickr. Image #1: Nikon M Plan 20X NA 0.40 ELWD objective, 55 frames in Zerene Stacker, PMax + DMap combined. Illuminated by Canon 580EX II Speedlite plus two Yongnuo 460 II flashes through paper diffusers. Image #2: Olympus 38 mm f/2.8 bellows macro lens at f/5.6, same illumination. Image #3: Canon MP-E 65 at ~2X, f/11, single 580EX II Speedlite with Opteka diffuser. Excellent technical series with nice explanation. That maxilla looks as though it would hurt if it was stuck in you. That maxilla looks as though it would hurt if it was stuck in you. It does, doesn't it? But these things never poke people, as far as I've ever heard. There are other bugs that do. I've never figured out how to tell them apart except by experience, so I handle with great care anything that has an apparently rigid snout. I'm sure this would make me look rather silly to some of my more knowledgeable friends, but on the bright side I like providing amusement.